There aren’t many clean brands out there with a serious focus on healing acne, especially the type of acne that occurs in adulthood. If you’re one of the many people trying to balance your skin and get rid of persistent breakouts, I’m excited to introduce you to moss, the brand that is tackling acne head-on with nutrient dense plant based products. moss specializes in healing acne naturally and teaching radical self-care. Their formulas employ Ayurvedic and holistic medicine to address problems that aren’t responding to normal skincare solutions. moss has a large product catalogue for such a young brand, and while trying to figure out what might work for my skin, I initially wondered how I could benefit from moss as someone who rarely has acne (my teenage self would never believe it). I quickly discovered that moss has tons to offer someone like me. Their products contain ingredients that are nourishing and anti-aging, too. That’s because moss doesn’t try to stop acne by drying your face out with harsh ingredients. Instead, it nourishes and introduces botanical oils and butters that work beautifully for acne and skin that is maturing. I received a selection of moss products to try out, and though I haven’t had a long trial period with these goodies, I’m already impressed with what results I’m seeing and the lovely experience moss offers. With the brand launching at Integrity Botanicals this week, I wanted to share some initial thoughts on moss. Miel Noir PH Balancing Cleanser — One of the more unique cleansers I’ve ever tried, this is a great morning cleanser due to its gentle nature. It doesn’t remove makeup or do the heavy lifting of an oil cleanser that I need at night, but in the morning it helps cleanse and prep my skin for the day. It leaves your skin moisturized, but the ingredients like raw honey, perilla oil and white willow bark fight acne-causing bacteria and provide gentle exfoliation. The Miel Noir is indeed a rich shade of black thanks to the activated charcoal, and the consistency is more like a lotion or gel with an almost imperceptible grittiness to it that helps slough away dead skin and pore clogging debris. Clear Resolution Anti-Inflammatory + Vitamin C Lightweight Rebalancing Facial Oil — I’m a sucker for anything with vitamin C, and this oil contains plenty of it thanks to cold pressed unrefined guava seed oil. Also featured are rose, milk thistle, perilla and hemp oils to name a few. It’s a facial oil designed with high linoleic oils that are well suited to acne-prone, oily skin so you can get the benefits of a facial oil without exacerbating acne issues. The scent is strong, fresh and herbaceous. I was thrilled to have this on hand last week when I came home from New York with major stress-related flare-ups. Two nights with the Clear Resolution and my skin was clear again! Healing Dew Anti-Inflammatory Hydrating Serum — Vitamins and minerals anyone? This is a close tie with the eye treatment for my favorite moss product so far. It smells and feels glorious. Healing Dew is an “absorbing fluids” that was created to add hydration and also help facial oils absorb better and deeper into the skin so you can get every bit of nutrient they offer. You can either apply this serum on top of an oil, which will give a dewy rather than shiny finish (great for when oils seem to sit on top of skin rather than sink in properly), or you can blend with an oil and then apply. The ingredients are a blend of hydrosols and herbal extracts. I love that it also contains MSM, a mineral compound that supports collagen and keratin but also enhances the skin’s ability to absorb all of the nutrients in your botanical products. Behold Seaweed + Coffee Active Lipid Cream for Eyes — A potent but gentle blend of serious ingredients for under eye health, this formula caught my attention thanks to the green coffee bean oil, spinach seed oil, tomato seed oil, ghee and other herbal extractions that I know to be brilliant for the delicate skin around your eyes. It’s a rich, dark green balm that sinks in nicely. You only need the tiniest amount, like a grain of rice or less per eye, so this is going to last forever. It’s too soon to see the long term benefits, but I love how plump and fresh it makes the skin around my eyes. I’m using it morning and night, with no trouble applying makeup over it. Ceremony Skin Exalting Everlasting Beauty Balm — I’ve been so impressed with balms lately. The right balm leave my skin well conditioned and velvety soft, but it doesn’t feel heavy or occlusive. Ceremony is a brilliant example of such a balm. It’s decadent and rich but absorbs so well, and it contains a touch of gold mica that makes your skin glow (rather than shimmer and sparkle—not a look I’m into at my age). 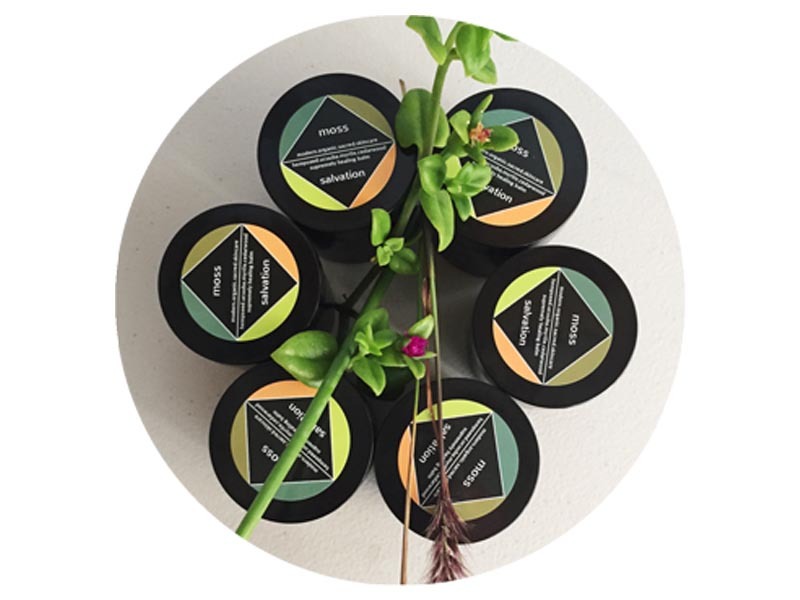 Some of the butters in the formula include creamy mafura and rejuvenating cupuacu, while green coffee bean oil and buriti oil add high levels of antioxidants as well as natural sun protection. Ceremony is a true treat that reminds me to celebrate the skin I’m in. All of these moss products and more will be launching at Integrity Botanicals soon! Stay tuned for a special offer.